Birmingham, AL – The Tennessee football team will start the 2018 season in Charlotte against West Virginia at Bank of America Stadium on September 1st, 2018 and wrap up the regular season at Vanderbilt on November 24th, as the SEC announced the 2018 schedules for all 14 conference schools. Following WVU, Tennessee will host ETSU (September 8th), UTEP (September 15th) and Florida (September 22nd) at Neyland Stadium before traveling to Athens, GA, to face Georgia (September 29th). 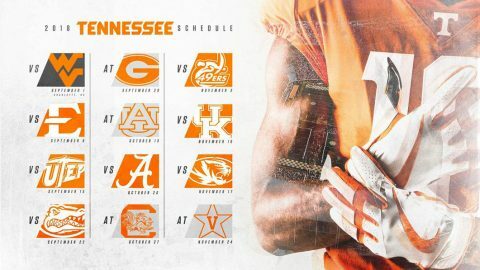 UT’s bye week falls on the weekend of October 6th. After the break, Tennessee will travel to Auburn on October 13th to face the Tigers for the first time since 2013. The Vols host Alabama on October 20th before traveling to South Carolina on October 27th. Tennessee opens November with a three-game homestand starting with the Vols’ first-ever game against Charlotte (November 3rd) before welcoming Kentucky (November 10th) and Missouri (November 17th). UT ends the regular season at Vanderbilt on November 24th. The SEC Championship Game will be played on December 1st in Atlanta and Mercedes-Benz Stadium. vs. West Virginia Charlotte, N.C.
at Georgia * Athens, Ga.
at Auburn * Auburn, Ala.
at South Carolina * Columbia, S.C.
at Vanderbilt * Nashville, Tenn.